Schrödinger’s Cats - Review — GamingWithSwag.com - Dads By Day, Gamers By Night. Before I get started with the actual flow of the game, I need to mention something that is incredibly important to the enjoyment of the game. DON’T play this game with only 2 people. I repeat, DO NOT play this game with only 2 people. It will disappoint you and the person who you swear to that everything will be fine. It will not be fine. However, ABSOLUTELY PLAY THIS GAME with 4-6 players. It’s a great time, laughs will be had, some light backstabbing will occur and while you’re sitting on the sidelines because your experiment was disproved, you’ll be thinking up new strategies for victory in the next game. Now, onto actually playing the game. 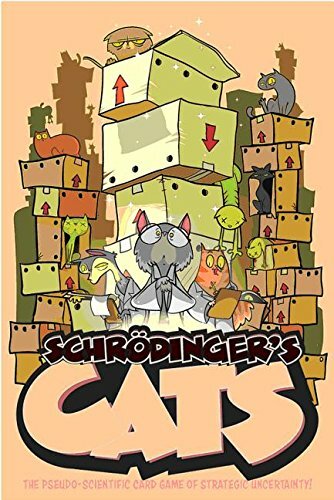 To begin, every player picks a cat physicist at random. Each one of these whimsical, anthropomorphic lab cats has a unique ability, for instance Sally Prride’s talent is to ignore all Heisenberg cards (wilds) this round. Neil Degrasse Tabby’s ability is to add 2 Alive Cats to the Findings for the current round. This could get you out of a pinch if you hypothesized a large number of Alive Cats and fell a bit short. NOTE: You can only use your physicist power ONCE per game, not once per round. Big difference! After shuffling the main deck, each player gets X amount of cards, where X is the number of players. This will change throughout the game because at the end of each round, there will one less player until it gets down to the final round (1 v. 1). Turn order is determined by the player that most recently watched a documentary, and on that player’s first turn they make a hypothesis regarding that round’s “experiment”. The “experiment” involves ALL of every player’s cards (seen and unseen) and a hypothesis can only be a guess of how many Alive Cats, Dead Cats or Empty Boxes (not a combination) exist among all of the cards. The catch? You can only increase the hypothesis, you can’t decrease it, and it cannot stay the same. So eventually, a player is going to be forced into making an awkward hypothesis and risk being called out. If one scientist calls out another scientist and asks them to prove their hypothesis, all cards are shown and if the hypothesis is accurate, the scientist who asked for proof is knocked out of the game and a new round starts. However if the hypothesis is false, and there aren’t enough cards to satisfy it (including wilds! ), then the player who made the hypothesis gets the boot. The next round starts with one less player and you rinse and repeat. The rules could definitely use some reorganization/clarification. I highly recommend watching a video play-through to help get your bearings. The rules themselves are printed on your standard glossy paper, in a pamphlet fold. Super fast! Shuffle your main deck, deal cards to each player equal to the number of players, deal each player a physicist and you are all set. This is entirely a card game, and the cards are of good quality glossy card stock. Just what you’d expect. However, there was a little bonus in my box, a sheet of cat stickers designed by James Stowe. Nice! The reason for my emphasis on playing this game with 4 or more players is due to experience. My girlfriend and I took this one for a spin and spent about 30-40 minutes on the rules, trying to figure out if we were doing something wrong. Alas, we weren’t. The game for two is simply a one-round, short burst of play. It wasn’t very enjoyable, and as a result, this game collected dust for a few months until I busted it out again for a larger game night. I’m VERY glad I did, because honestly, I had a lot of fun getting into it. YMMV. Think of it as a slightly more complicated version of “BS”, with better artwork. I would definitely play this again, especially as a warm-up to a larger and longer game. Thanks for reading!